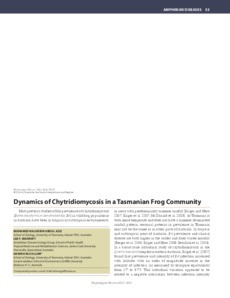 Most previous studies of the prevalence of chytridiomycosis (Batrachochytrium dendrobatidis, Bd) in wild frog populations in Australia have been in tropical or subtropical environments, in areas with predominantly summer rainfall (Kriger and Hero 2007; Kriger et al. 2007; McDonald et al. 2005). As Tasmania is both more temperate and does not have a summer-dominated rainfall pattern, seasonal patterns in prevalence in Tasmania may not be the same as in other parts of Australia. In tropical and subtropical areas of Australia, Bd prevalence and clinical disease are both higher in the colder and drier winter months (Berger et al. 2004; Kriger and Hero 2006; Retallick et al. 2004).